I had a lovely companion for 9 and a half years. Our lives together ended yesterday when Belle died in her sleep at home. I'm writing this because I need to say the things I'm not saying. I'm writing this because I fear I will forget her. The feel of her coat. The inquisitive wet nose. The slight lift of her ears when she heard her name. I guess she had been sick for a while. Other people seemed to see it easier than I did, but I just couldn't accept that she might leave me so soon. Somehow I had gotten in my head that she would last until 10 years. That I would get the long decline of health, sight, and hearing I had seen in other dogs. It didn't happen that way, and I was blind to it. I wanted to be there for her. Belle was very special to me. 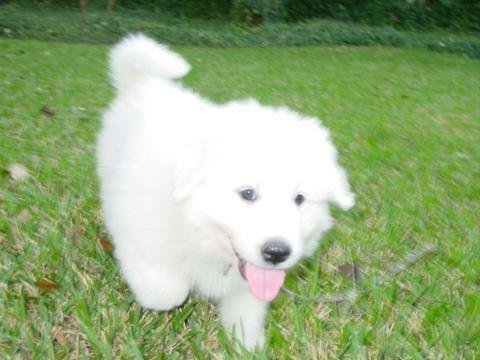 Right after college I researched how to get a Great Pyrenees, a breed I knew well from childhood when I could go and play with one in the neighborhood. 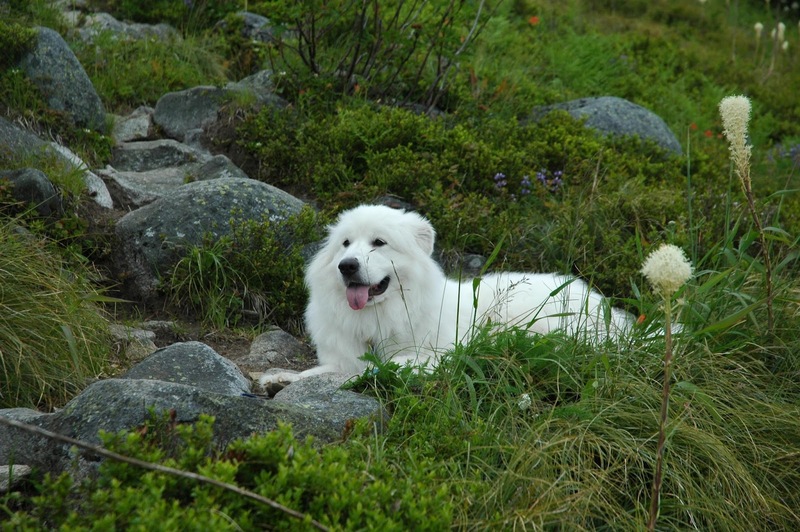 I'm also told my favorite cartoon as a child was Belle & Sebastian, about a young boy named Sebastian and his adventures with Belle, a Great Pyrenees. 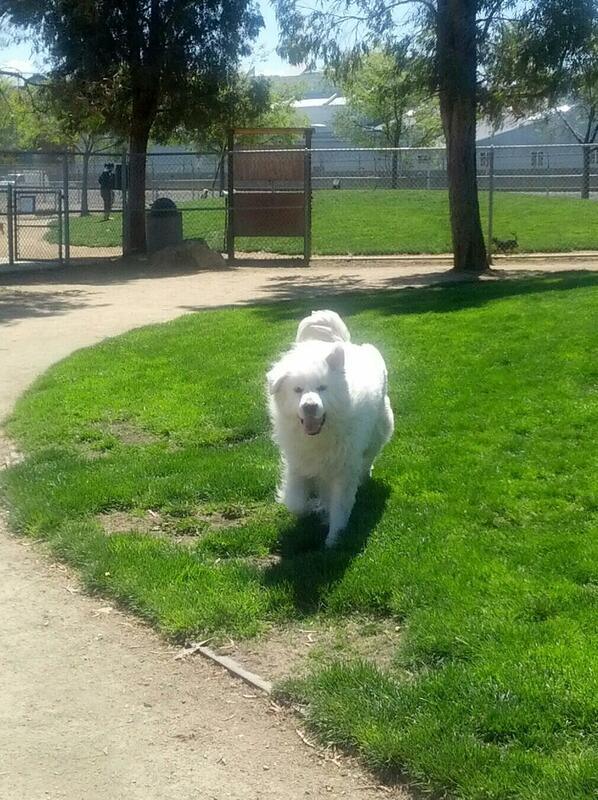 I knew when I graduated that I wanted a dog and I wanted a Pyrenees. When she arrived at the airport, I had only had a few old photographs of her as a very young puppy. They brought out a dog in a crate and told me to sign for her. I looked the crate and saw a beagle. A while and brown beagle. I suddenly had visions of a breeder that had lied to me about the dog I was getting. Fortunately before I could drive home with my new beagle companion, another family complained that their beagle had been turned into a Pyrenees puppy. I brought her home after that and she was a terror. Never underestimate a dog that will grow to 95 lbs as a puppy. She would knock into things, jump up on people and generally be a nuisence. But I loved her. One time in particular, I was making biscuits to bring to a dinner at a friends house. I had put a batch in the oven and was going to do one more. I walked out of the kitchen after placing the unheated log of dough on the stove. I turned back almost instantly, but belle already had 3 quarters of the thing down her throat. So yes, she was not always easy to live with (especially in the 2 bedroom downtown apartment in Seattle), but she was always loving. She loved to get up on the couch when I was sitting there and just lie down next to me. She love to snuggle with me on the bed and beg for belly rubs when I was trying to go to sleep. Other things she liked to do included barking, surveying her lands from a high vantage point, and chewing furniture. As she got older, she and I learned how to live together. Towards the end the only things we disagreed on were how much the gardeners were to be trusted (NONE said she) and if I should ever pack a suitcase again. One thing I always found endearing about her was her lifetime ability to chase her tail. She had the most gorgeous long fluffy white tail that would whip around like a fan an catch lots of wind. Because of this she could sometimes catch her tail in the corner of her eye, and then it was off to the races! She would spin and spin and spin in circles trying to grab that tail. She almost always caught it to. When she was a puppy she would gleefully chomp down on that white fluffy tail and give a little start. When she was older she would just chew a little on the fur at the ends. She was my companion every day of our time together. Even when we were not together physically I would think about her often. I almost always worried about her while I was gone, and several times considered getting an internet-enabled camera so I could make sure she was doing okay while I was out. She gave me so much love and devotion. She was so gentle with everyone, at least once she wasn't a puppy, and she loved being with people. I always knew a day like yesterday would come. I always knew that one day I would be standing and she wouldn't. I always thought that I would be with her, that I could help her through that time. I thought I would have more time. She gave me companionship and love for 9 and a half years, when others left me, she stayed and was unconditionally happy. My grief process is just starting with her. I know that I will miss her for the rest of my life. As rational-science driven person, I don't believe she lives on. But as a human being, as a dog owner, as the human father of Belle. I hope she is out there stealing dough and lying on couches just watching people. I hope she is jumping on unsuspecting women in the street and pulling their tops down. I hope she's chewing through couches and making people buy entire trucks for her. I hope she gets to run in a wide open park and have all the bacon treats she wants. To my friends that knew my friend and companion. If you can remember anything about her, good or bad, I would really appreciate anything you care to write. Oh Ben, I am so sorry for your loss. I didn't know Belle well, but what was so wonderful about Belle was even if you didn't know her she would greet you wholeheartedly. It was so obvious you were totally and completely her person. Thank you for sharing about her. Ben, you've written a beautiful memorial. I'm so sorry she's gone. Going to bed last night and waking up this morning, I came to the part of the bed where I expected to have to watch my feet because there would be a huge fully dog and I didn't want to step on. She leaves a fluffy white hole in our lives. She was such a game creature. You want to walk another mile of California trail back to the car? Well, she's kinda creaky, but that still sounds good! A fascination to little kids, and the way she honed your little-kid-telepathy skills. The same questions on every walk, cheerfully answered. She was so expressive. The "hoof" noises of "really? You're not sharing dinner?" Eyebrow waggling. And she was such a cheerful critter. Those puppy years were crazy in that little apartment. Trying to convince Belle to not jump on you was totally a lost cause...it was more a battle to prevent your face from being regularly licked. And of course going on walks where the absolute last thing on Belle's mind was doing her business. "Ok human I'm finally read...oh wait is that a weed up the road!?! That's so cool! Better check it out." Things were much chiller in the later years were Belle had a yard. Still wanted more petting that I was ever in situation to provide though. I'm sorry Ben. Belle was a beautiful (and overpowering) dog. Fortunately, I've had the day off to think this over. Belle was a pretty epic dog. I remember meeting her for the first time at your house and thinking, "dang, she owns this place." She was quite a force to reckon with. My favorite pic of her is Rick and her looking into each other's eyes. Check it out on Facebook, it's in his pictures. After the memories, my mind ends up being a jumble of thoughts and emotions. The day of was one heck of a day. A lot of tears, and apologizing, and being thankful of the company and friends surrounding to love and remember and support. Even in the face of those facts, each one of us has an incredible, powerful and fantastic strength to overcome and continue. Through death, we are all connected, it's a universal understanding. It's something I remind myself about once in a while, when I see a stranger, or some jerk in a store, or a loved one, or when I'm surrounded by my closest friends. The great thing is, Belle does not simply end. That energy and life carries on in thought, and in love. It will change and transform through time, and it will change hearts and minds through you and those around you. With that all said: I'm so very sorry for your loss. You're in my thoughts. And we are not all alone. Love you, my friend. 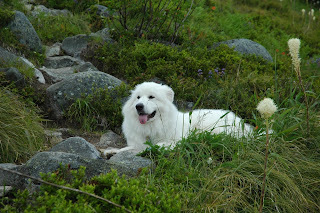 I had never seen a Pyrenees before Belle, and my first thought was "Holy moly, Polar Bear-Dogs are real"! I often worry about how I will feel if something were to happen to my cat, and it must be a hundred times worse when it happens. I hope you will take enough time to grieve. You and Belle are in our thoughts. She was such an amazing dog - so happy and loving. Even when she was in pain she would light up with an enormous dog smile when she looked at you. I've really been struck by how connected the two of you were. Even in a crowded room, you both always seemed aware of what the other was doing and feeling. Mike and I are very sorry for your loss. I remeber sitting on the love sac in your living room in Seattle with Belle. She was so cuddly. She shed A LOT and was a great dog. She will be missed.